We have for sale a 3x7.5" United States Dollar signed by American comedian and producer Bud Abbott who is best known as the straight man in the comedy team Abbott and Costello. 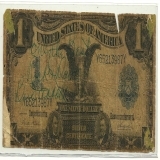 The dollar bill is tattered as is visible and signed in green ink. Your satisfaction is guaranteed. Shipping/Handling/Insurance Policy All items are carefully packed and insured, with no handling or packing fees, ever. Please do not attempt to return an item due to shipping damage. Should it occur in spite of our careful packaging, this must be handled through the shipping agent with an insurance claim. We will be happy to assist in this. Always be sure to retain all original packaging if a claim is to be made as the shipping agent may request to examine it. That being said, in over 10 years of internet shipping, we have had only one damage claim. Shipping is usually done within 24 hours of the receipt of a cleared payment. Shipping may delayed for a few days if we are away from home at an Antique Show. Please feel free to contact us with any inquiries about items or shipping. We will respond within 24 hours. Any shipping over payments will be quickly refunded. Other Information Sales tax applies for items shipped to California. A valid resale certificate is required for tax exempt sales delivered to California.